Poore is "in great trouble" in Appomattox, Virginia. INFORMATION WANTED OF J. W.
“R.B. Poore searching for his brother-in-law, J.W. 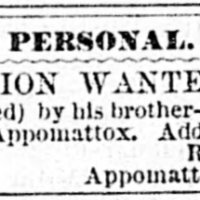 Hill,” Information Wanted Ad, Richmond Daily Dispatch (Richmond, VA), June 12, 1876, Last Seen: Finding Family After Slavery, accessed April 19, 2019, http://informationwanted.org/items/show/3305.